In January of 2016 a group of parents, educators, and youth came together in a local school district board meeting room to discuss gender diversity issues and concerns for the youth. 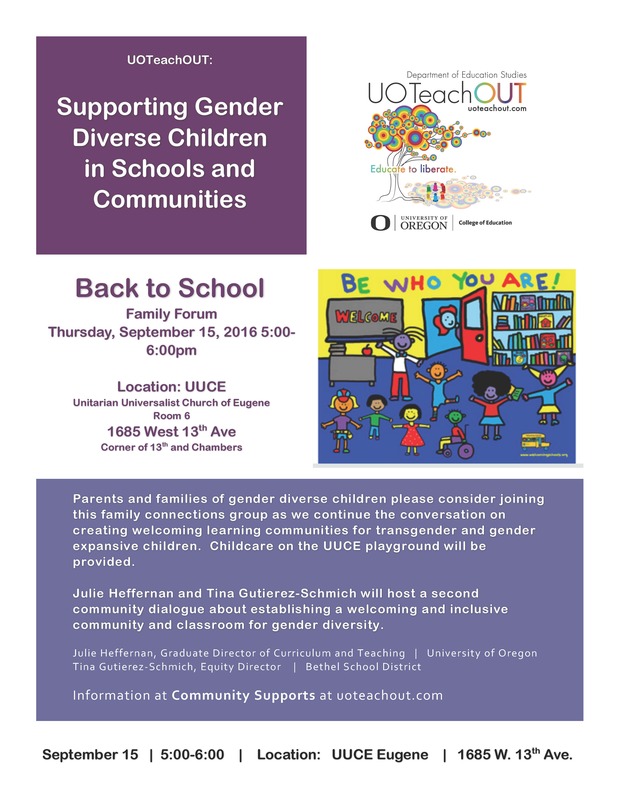 In May of 2016 some participants from that group came together again through a UOTeachOUT community forum to connect with Portland based TransActive and to learn from Heffernan and Gutierez-Schmich about an elementary education approach to Welcoming Schools for gender diversity. In preparing for the fall of 2016 the group is launching a Family Support Group for families with gender diverse youth. There will be an information table for UOTeachOUT, Welcoming Schools and The Gender Diversity Family Support Group at the Eugene Pride Celebration on Saturday, August 13th at Alton Baker Park. This new group will hold an initial interest meeting in September. See flyer below. Heffernan and Gutierez-Schmich will share back-to-school resources with families and parent coordinators will survey the group to explore interests, concerns, and needs to develop a support network.